Hi, I am interested in your 1967 Dodge A100 (stock #5062-CHA) listed on Autotrader for $28,995. I'd like to get more information about this vehicle and confirm its availability. We cant help but call this one the Little Red Wagon. After all, this 1967 Dodge A-100 Pickup has the bold red color. Plus, the supercharged 360ci V8 heart means its just as wild as the legendary drag racer. 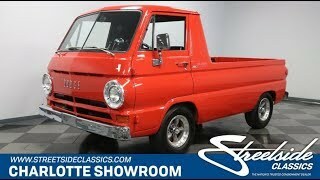 A Dodge A100 truck is already a rare sight these days, so you know this one will grab plenty of attention. Good thing that the red paint has plenty of gloss and shine, and the unique truck sheetmetal is complete and correct. So this one makes the right kind of first impression with the look of a quality investment. Plus, the details are correct with bright bumpers, crisp headlights, and a great set of American Racing Torq Thrust D competition wheels. And you might have also noticed the decals on the side that announce the serious power within (more on that in a moment.) These forward control trucks offer a nice cab with bucket seats, flat floor, and a commanding view of the road. This one continues that tradition with a look of classic industrial attractiveness thats both simple and comfortable. Of course, the addition of the large tach right in front of you and the B&M handle on the console shifter are a nice reminder that theres something special nestled between the seats. The growl this one makes might surprise some. Thats because the factory never offered anything as large as the 360 cubic-inch V8 that is currently powering this van. Plus, theres also the unmistakable buzz of the B&M supercharger that means this truck knows how to haul asphalt. This mighty motor even inhales deeply with an Edelbrock four-barrel carburetor and exhales with authority as long tube headers feed a Flowmaster side exhaust. And with a stout Torqueflight A727 three-speed automatic transmission and Cooper Cobra tires, you get all this power out to the streets. The sale comes complete with build receipts, owners manual, and restoration photos. This little red wagon brings serious power to the streets, so its not for the faint of heart. But for those who love a true rush of power, this is the unique speed machine youve been waiting for. Call now!